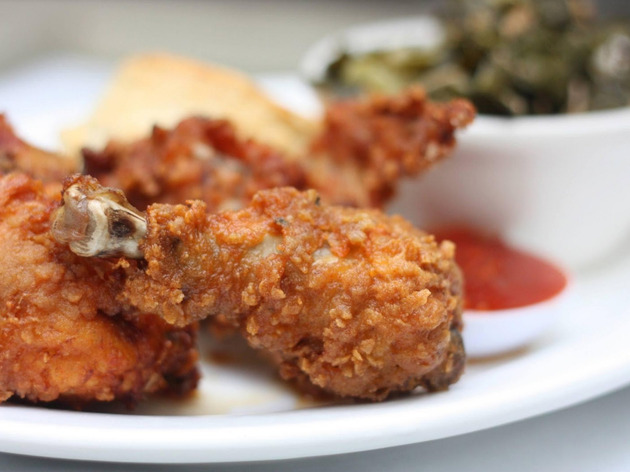 Chef Brenda Buenviaje is Louisiana-born, and her southern-style, “secret recipe” fried chicken—known as BFC for Brenda’s Fried Chicken—doesn’t disappoint. Crackly, golden-brown, and slightly spicy, it’s served at both the crowded Polk Street location, where antique mirrors line the walls and noise bounces off the pressed tin ceiling, and the newer Brenda’s Meat & Three on Divisadero (919 Divisadero St, 415-926-8657, brendasmeatandthree.com), where you can snag a seat at the curvy bar. 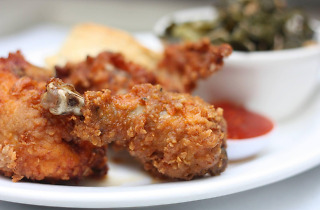 A two-piece fried chicken meal is served with fries, coleslaw and a moist cream biscuit at lunch and with three-pieces, hot pepper jelly, a biscuit and collard greens at dinner. Avoid the weekend wait and go for dinner, when the endless chalkboard list of those waiting for a table runs considerably shorter. Cap off your meal with fresh-from-the-fryer beignets.